The world waits for Hillary Clinton’s new book, “Hard Choices,” on June 10th. I know I have it all queued up on amazon.com. But Clinton’s hardest choice may start at home: will she give her ghost writer a credit this time? 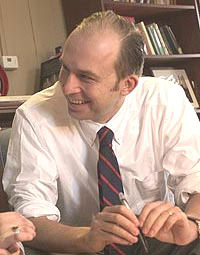 Widmer, 51, is a Harvard graduate who wrote for the Harvard Lampoon. He has a long association with Brown University, where he was the Director of the John Carter Brown Library.At least that’s where used to be. Widmer now works out of the president’s office at Brown. After all, his prestige factor has rise considerably. Last year I wrote that Widmer has conceded that Clinton–though she hasn’t said so directly– is “incredibly organized and planning her campaign.” He sent me an email later claiming: “I have neither said that or anything like it to anyone, nor is it something I believe.” Well, it’s a year later and Hillary is pretty much the front runner for the Democratic nomination. But what credit will Widmer get on “Hard Choices”? Clinton caused an uproar with her bestseller, “It Take a Village,” when she denied the ghost writer any identification at all. That book was written by Barbara Feinman, a Georgetown University professor. Feinman was paid $120,000 for seven months’ work. She eventually went public and complained about lack of credit.